Choosing the right tire changer is more difficult than in the past. The many sizes and types of tires make selecting the right changer to fit every need more complicated. In many cases the traditional table-top model with a side shovel is a great choice. They are strong, powerful and many technicians have used them in the past. 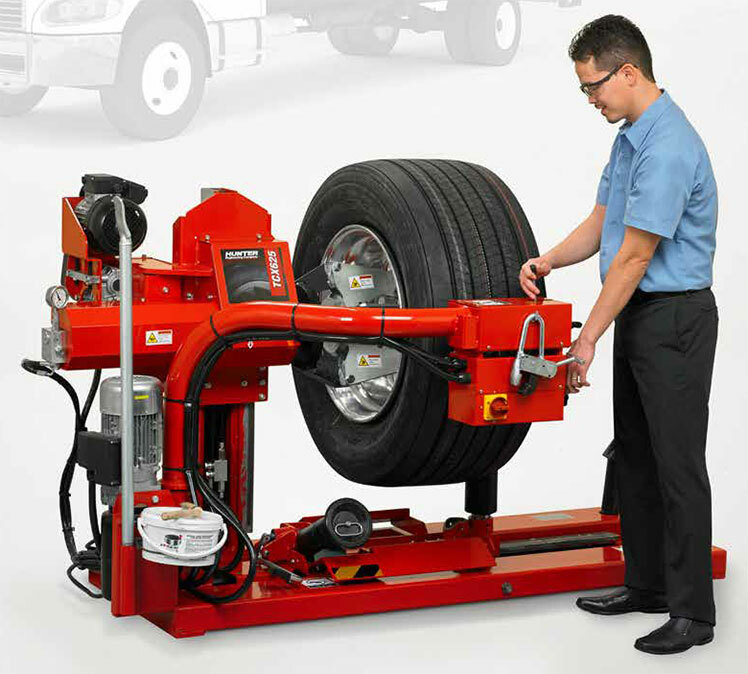 However, today’s expensive rims and tires have created a new class of center-clamp tire changer. These models offer extra rim protection and often feature bead loosening rollers. Call Total Tool, our knowledgeable sales staff with years of experience with Hunter products will provide you with the knowledge to pick the model just right for your auto service shop. Some helpful information on how to choose the best changer for your shop can be found here. This is truly one-of-a-kind. The Revolution™ automatic tire changer is the easiest tire changer to use in the industry, and recognized as the 2015 Motor Magazine Top 20 Tools Awards, as well as a PTEN Innovation Award and PTEN Innovation Award’s People’ Choice Award all in 2014. Fully automatic, featuring a space saving wheel lift, “Go” Pedal and Powered Press Arms. Did we mention this tire changer tool is fully automatic? Step up to the Revolution™ automatic tire changer, and add the convenience and superiority of Hunter Engineering products to your shop. The Revolution™ with WalkAway™ capability features 80-seconds of autonomous bead breaking and demounting that can be performed without an operator present. 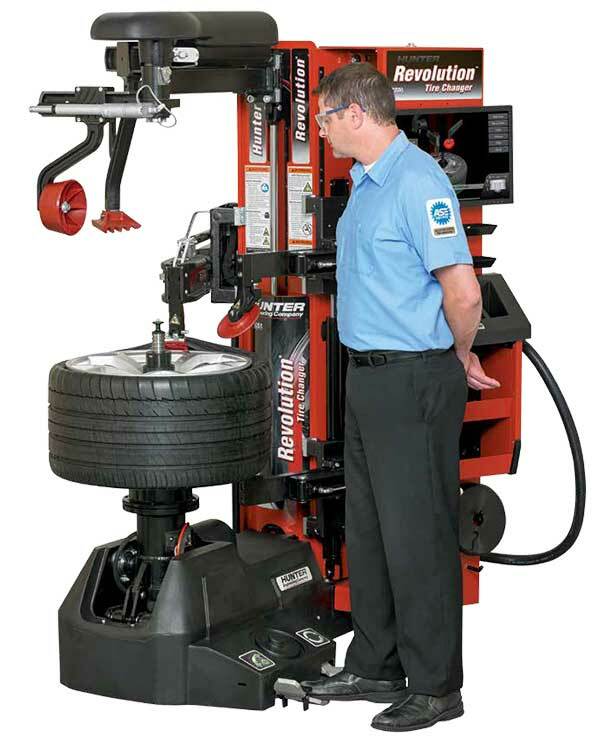 The Revolution™ allows the operator to “walk away” freeing them up to perform balancing procedures or other shop tasks during the longest portion of the tire changing action. WalkAway™ also reduces operator effort and potential errors. During WalkAway™ the operator simply loads and unloads the assembly, orients the TPMS, enables WalkAway™ then offloads the old tire. WalkAway™ increases the automatic and autonomous operation of the Revolution™ changer to save technicians time, effort and mistakes. When paired with wheel balancing, over 25% time savings is possible. No other changer compares to the Auto34 rim clamp from Hunter Engineering. The Auto34 electric features a lever-less tool head, simple push button controls, and an electric motor extorting over 850 foot-pounds of torque and variable speed. Unlike other tire changing tools on the market, the Auto34 also comes standard with a blast inflator and an innovative bead press arm. Learn more about the Auto34 and what makes it the top electric changer on the market today. Hunter’s TC37 features a traditional mount head that protects rim and tire, and a vertical locking head that protects wheel face. The TC37 provides an intuitive center-clamp system with three height positions and a simple clamping technique. It has a single pendant control, bead press arm, two bead loosening rollers with direct indention and powerful variable speed drive. Hunter’s TC39 features an easy-to-use leverless demount head that positions the bead without the use of a lever, and prevents damage to the tire and rim. The TC39 provides an intuitive center-clamp system with three height positions and a simple clamping technique. It has a single pendant control, bead press arm, two bead loosening rollers with direct indention and powerful variable speed drive. 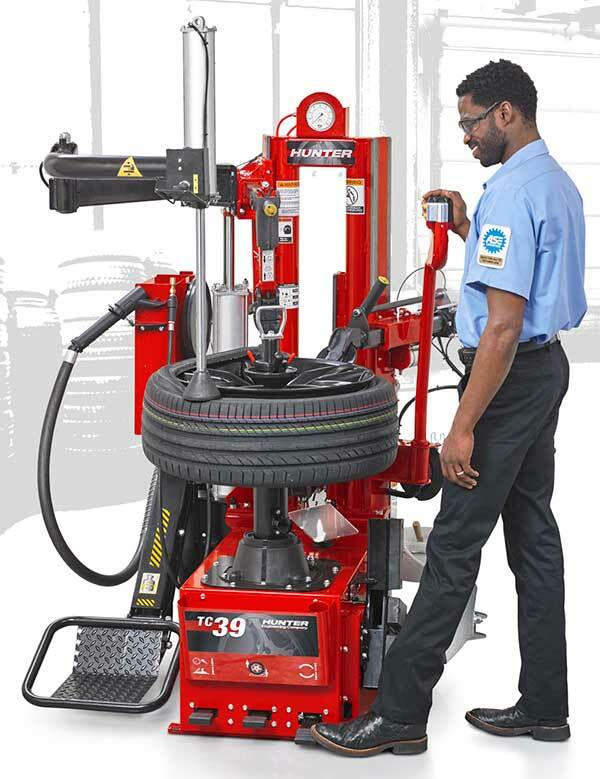 The Hunter TCX57 leverless conventional tire changer combines traditional design elements with advanced capabilities to provide superior service with simple operation and provides superior tire changing capabilities. The TCX57 features a swing-arm mounting apparatus and a tabletop clamping system familiar to most technicians. The leverless tool head lessens the stress on the operator and eliminates potential damage to beads and rims. 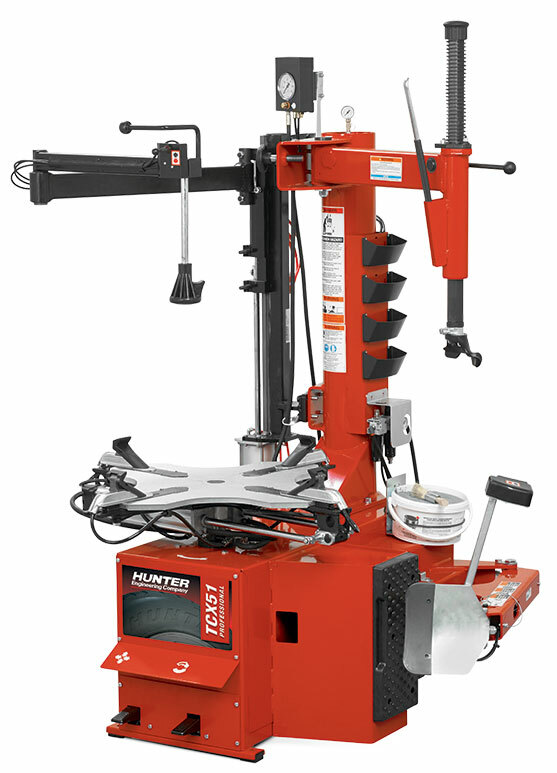 Hunter’s TCX53 Performance Tire Changer is a conventional tire changer that features a bead press system that speeds and eases clamping, lubricating, demounting and mounting tough wheel and tire combinations. The TCX53 is heavier, more rigid, faster and more powerful than all tire changers in its class. 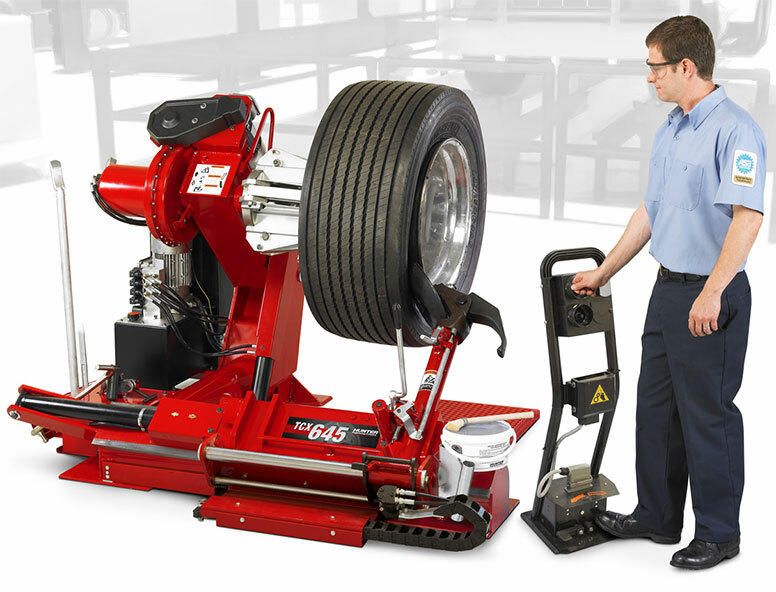 Hunter’s TCX51 Professional Tire Changer is a conventional tire changer that features a bead press arm that eases clamping, demounting and mounting difficult combinations. The TCX51 is heavier, more rigid, faster and more powerful than all changers in its class. 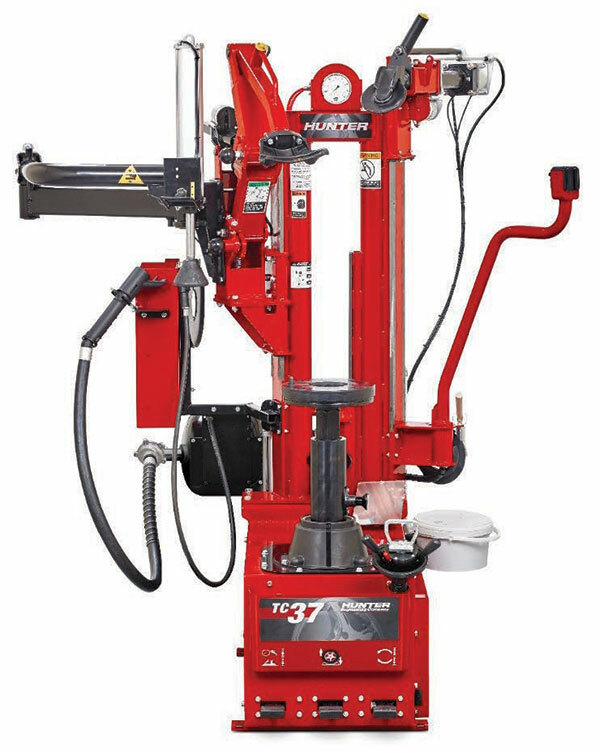 The Hunter TCX625HD heavy-duty truck tire changer combines compact size with a unique mount/demount roller mechanism making it a high-performance tire changing machine. The TCX625HD is optimized for servicing of heavy-duty, over-the-road truck assemblies. The TCX625HD allows for fast and easy demounting and mounting in as little as 30 seconds. 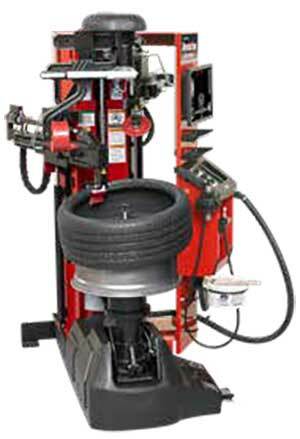 Safety is a standard feature of this heavy duty tire changer, which functions close to the ground with no hammers, bars or lifting required. 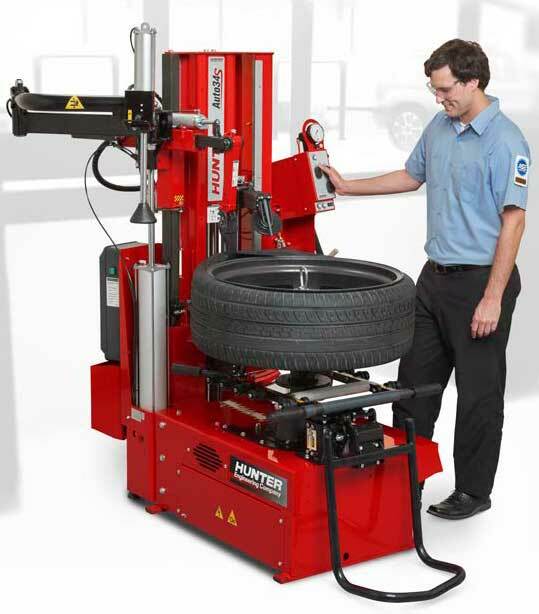 It’s the perfect tire changing machine for specialty wheel assemblies, complete with a standard hook attachment to mount and demount tubed, sharp edge and more wheel types. The Hunter TCX645HD is an efficient electro-hydraulic-powered heavy duty changer that combines a range of unique features and capabilities to make wheel service for trucks, buses, tractors and other specialized machinery faster, easier and more profitable. 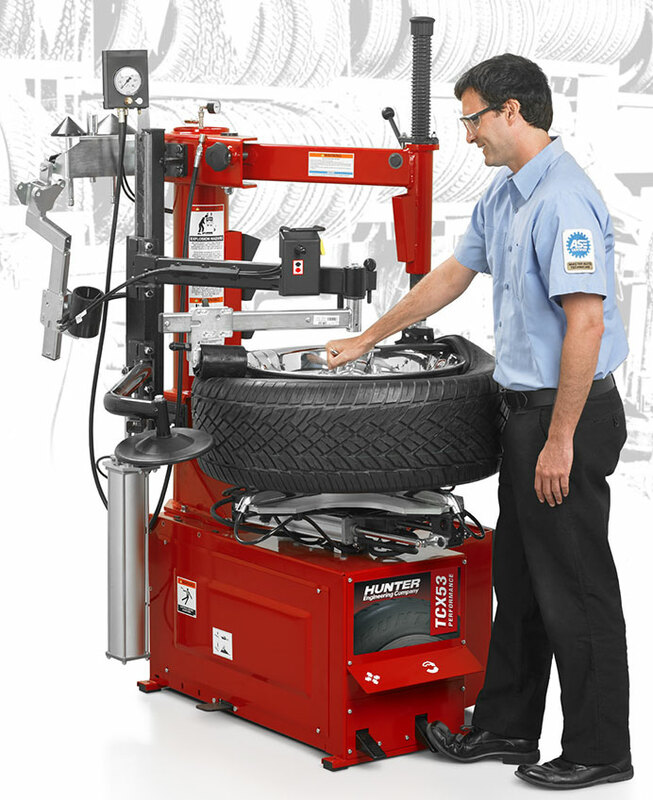 This tire changing machine can do it all. 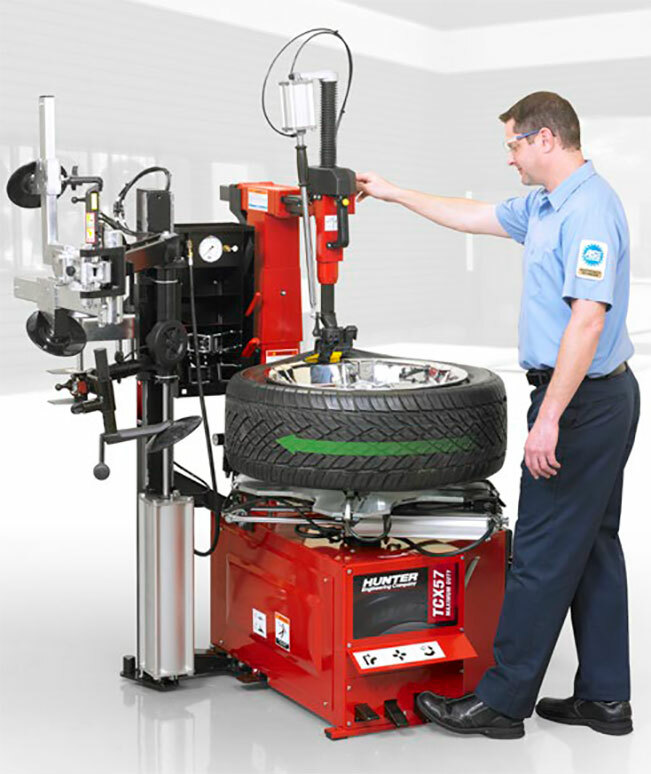 The exclusive operator-friendly features of the TCX645HD Tire Changer make operation safe and simple. Features include standard disk and hook for mounting and demounting, hydraulic-powered carriage shuttles and integrated storage. 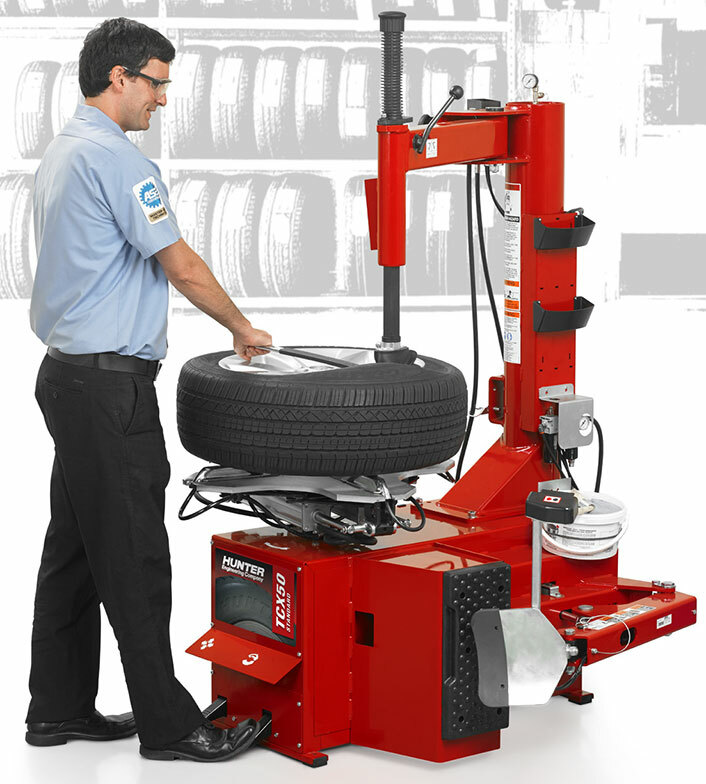 This powerful tire changing machine also has a 3527-lb capacity, and is incredibly efficient, running its power pump only when in use. 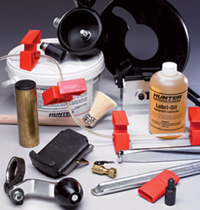 Total Tool carries a complete line of accessories.